(2014) "All the Way Up"
(2015) "All the Way Up"
(2016) "All the Way Up (Remix)"
(2016) "I Got the Keys"
(2016) "All the Way Up (EDM Remix)"
(2015) "All the Way Up (EDM Remix)"
(2016) "All the Way Up (Westside Remix)"
(2016) "Point Seen Money Gone"
"It's Not A Party Without Us"
(2016) "All the Way Up (Asian Remix)"
(2014) "All the Way Up (Westside Remix)"
(2015) "All the Way Up (Asian Remix)"
(2012) "All the Way Up (Asian Remix)"
"All the Way Up" is a song by American rappers Fat Joe and Remy Ma, featuring American rappers French Montana and Infared. It was released on March 2, 2016 by Terror Squad Entertainment and Entertainment One Music, as the first single from their upcoming collaborative album Plata O Plomo. The song was produced by Edsclusive and Cool & Dre and recorded at Diamond District Studios in New York City, New York. The song's accompanying music video premiered on March 26, 2016 on Fat Joe's YouTube account on Vevo. Remy Ma's husband Papoose, DJ Khaled (who interrupts the song), Fred The Godson and Farid Bang make cameo appearances in the video. The song peaked at number 27 on the U.S. Billboard Hot 100. It is Fat Joe's first top 40 hit since his 2007 hit "I Won't Tell", featuring J. Holiday, as well as the first top 40 for Remy Ma and Infared as solo artists. 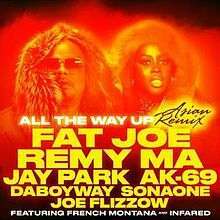 In France, "All the Way Up" has peaked at number 85, becoming Fat Joe's first chart entry in that country since 2002's "What's Luv? ", featuring Ashanti. On August 8, 2016, the song was certified Platinum by the Recording Industry Association of America (RIAA) for selling over one million copies in the United States. The official remix features new verses by Fat Joe and Remy Ma, including an additional verse by Jay Z. Rappers Meek Mill, Fabolous and Jadakiss also recorded a remix to the song. Rapper Papoose, who is also the spouse of Remy Ma, recorded a freestyle as well. An official remix by David Guetta and GLOWINTHEDARK was released on May 27, 2016. 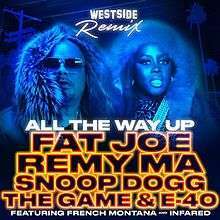 A Westside remix was released, featuring Snoop Dogg, The Game and E-40. A reggaeton remix is in the works which will feature Fat Joe, Daddy Yankee and Nicky Jam. In addition, a German "BangerMusik" remix with Farid Bang, Summer Cem, Kollegah and Seyed, was released. The Asian remix was released, featuring Jay Park, AK-69, DaboyWay, SonaOne and Joe Flizzow. ↑ FatJoeVEVO (26 March 2016). "Fat Joe, Remy Ma - All The Way Up ft. French Montana, Infared". Retrieved 1 July 2016 – via YouTube. 1 2 "All the Way Up (feat. French Montana & Infared) - Single". iTunes Store (US). Retrieved July 29, 2016. 1 2 "All the Way Up (feat. French Montana & Infared) [Remix] - Single". iTunes Store (US). Retrieved July 29, 2016. 1 2 "All the Way Up (Remix) [feat. French Montana & Infared] - Single". iTunes Store (US). Retrieved July 29, 2016. 1 2 "All the Way Up (Westside Remix) [feat. French Montana & Infared] - Single". iTunes Store (US). Retrieved July 29, 2016. 1 2 3 "All the Way Up (Asian Remix) [feat. Jay Park, AK-69, DaboyWay, SonaOne & Joe Flizzow] - Single". iTunes Store (US). Retrieved August 20, 2016. ↑ "Fat Joe feat. Farid Bang, Kollegah, Seyed & Summer Cem ► ALL THE WAY UP ◄ [ official Remix ]". BangerChannel / YouTube. Retrieved October 9, 2016. ↑ DREAMCHASER RECORDS [DCRMOTIVATION] (25 May 2016). "MEEK MILL FT. FABOLOUS JADAKISS - ALL THE WAY UP (DRAKE DISS)". Retrieved 1 July 2016 – via YouTube. ↑ "YouTube". Retrieved 1 July 2016. ↑ "Fat Joe – Chart history" Canadian Hot 100 for Fat Joe. Retrieved June 7, 2016. ↑ "Lescharts.com – Fat Joe / Remy Ma feat. French Montana – All the Way Up" (in French). Les classement single. Retrieved June 4, 2016. ↑ Chart Log UK: "CLUK Update 4.06.2016 (wk22)". UK Singles Chart. Zobbel.de. Retrieved June 20, 2016. ↑ "Fat Joe – Chart history" Billboard Hot 100 for Fat Joe. Retrieved June 8, 2016. ↑ "Fat Joe – Chart history" Billboard Hot R&B/Hip-Hop Songs for Fat Joe. Retrieved April 19, 2016. "There's Something About Remy: Based on a True Story"
"Take HD Special Maxi Album"